A band ravaged by fame found the best way to regain control was to relinquish it, writes Bernard Zuel. Spike Milligan played in a jazz band during and immediately after World War II before founding the Goons, but it's not his music that earned him a thank you in the liner notes for last year's Radiohead album Hail to the Thief. Thom Yorke, the band's singer and songwriter, recognised in Milligan a kindred spirit. As the fractured, sometimes nonsensical, sometimes piquant lyrics of the past three Radiohead albums suggest, Yorke shares with Milligan a love of absurdity in word play and how the randomness of language can sometimes conjure up a more potent result than any conventional effort. "The randomness of language especially. And the way whatever you have at that moment is what you work with," says Yorke, who reacted to his deification as a generation-defining lyricist after the massively successful 1997 album OK Computer by deliberately breaking down any structure in his songs. Much as he did with the way the band recorded and played music, eschewing OK Computer's grand guitar-driven rock for Kid A and Amnesiac's twitchy, electronic-driven songs that seemed fuelled by the nervous energy of the paranoid and the angry. Today, in the dimly lit gloom of a bland hotel room overlooking a tall ship in the harbour, Yorke smiles wickedly as he recalls in detail a favourite sketch from Milligan's late '70s show Q where Daleks were pretending to be an Indian family. A sketch that like some of Radiohead's edgiest material was "painfully long: it was funny and then it got scary." But there's something else he has in common with Milligan, what Winston Churchill called his black dog: depression. "I was reading this book that [Milligan] did, Depression and How to Survive It. He suffered very, very badly from depression and he was manic," says Yorke. "I don't have anything like the problems he had - not clinical depression at all - but there was lots about mania and creativity that made me feel better about how I work: this is normal. "Well not normal, but the upside of this feeling is the energy you have when you are in the mania stage and [this book] was a really important thing for me at the time." 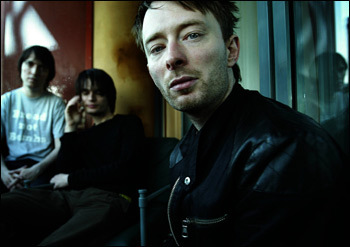 What has emerged in the years since the success of OK Computer is that Yorke and Radiohead were falling apart under the combined weight of a year-long tour and the attendant demands that come from having one of the decade's most important albums. As Yorke says now, by the time Radiohead came to Australia in 1998, at the tail end of that tour, "we weren't talking to each other at the worst because there was no point" and he was so detached that he often felt as if he was observing his body from afar. What some saw as a kind of madness afflicting Yorke when the band returned home - scrapping dozens of songs; rejecting anything that smacked of repeating patterns from the band's musical past; talking publicly of razing the band's collective ego to the ground - was one way of dealing with depression. Depression spawned by "months and months of seeing your own image projected and the echoes coming back at you, so you get to this level of detachment." "[The depression] is debilitating and sort of destructive but I don't consider that I'm in any way unusual," he says. "I consider that I'm very lucky because I have a way of dealing with it, which is working. [Using the] highs and the lows too. The lows are when you are like litmus paper: you absorb more when everything is twice as loud and everything is twice as bright." In retrospect, the post-OK Computer albums that confused as many as they attracted (though expected to mark the sales nadir of the band, both albums made it to No1 in the US) were the beginnings of the band's, and Yorke's rebuilding. The Radiohead that plays tonight and tomorrow at the Entertainment Centre is a happier, settled, in-control group. Though control is only part of it, says Yorke. "It's also letting go of a lot of things. For me one of the big things is I in no way feel responsible for that projection, how people see us. In a way we do what we do. We create these things that aren't even ours to create so it's not us who should be thanked anyway, which makes it all OK in a quasi-religious crap kind of way.